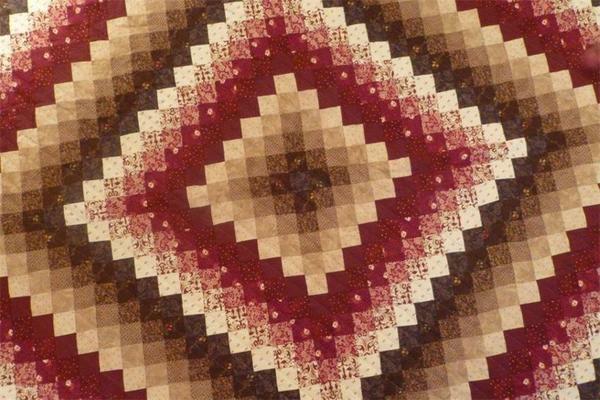 This quilt is hand quilted by an Old Order Amish woman in her home. The fabrics pieces in this quilt create a true work of art. The warm earth tones will look beautiful all through the seasons of the year in your bedroom. This quilt measures 106" by 114". Amish Quilts make great holiday gifts or wedding gifts. The Amish quilters are know for their geometric quilt patterns and the Sunshine and Shadow quilt pattern is an excellent representation of that. The Diamond in the Square quilt pattern has a similar look with the diamond in the middle having the same geometric square look.